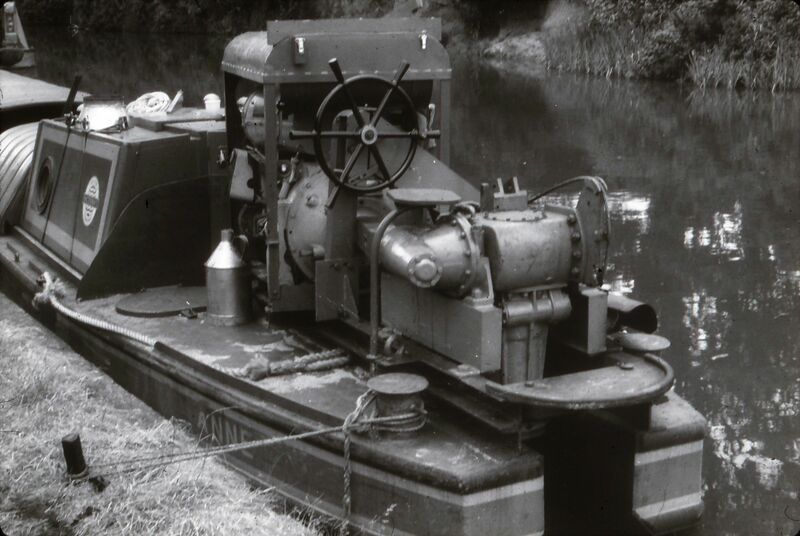 I suspect this is the Anne or Lee built by EC Jones of Brentford c.1960 for BWB. Fitted with Harbourmaster drop-in propulsion units - effectively large diesel outboards. Both boats now have conventional motor sterns. And close up picture of Lee's engine. It’s not specialist as apposed to bwb’s attempt at evolution. no accomodation and blue tops. in theory a good idea. At least two of these boats ended up with the Thames Conservancy as sewage boats for emptying elsan stations. ...is it me or is it mad that a boat museum cant identify that boat...? Apparently they were next to useless on the canals, but OK on the river. I read it that they knew what it was, but were giving readers a bit of challenge to see if they could answer it. Tim Lewis, sometimes of this forum, is often involved in posting those London Canal Museum archive photos - I'd be surprised if he didn't know. A photo by Roger Lorenz circa 1969. That's the boy alright. Steerer totally exposed to the elements. They could go some. I couldn't find any pics - not surprising, they were sewage tankers. 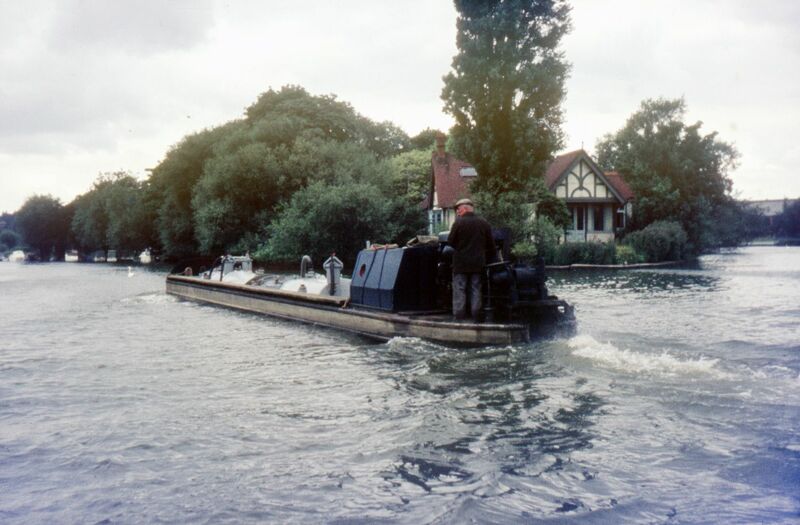 The river class butty at Oxford is the Beryl - Anne has been fitted with a conventional counter and is in the north west. I’m told that Anne and Beryl, the only two boats not named after 3 letter rivers were named after E C Jones (the builder)’s daughters. That’s a relief, I thought my memory was playing tricks with me again. Anne is a regular visitor at Whaley Bridge selling solid fuels. The London Canal Museum’s photo is of the Lee. Note different engine casing to Anne and the name just discernible on the stern. But the boat is not converted - it was built like that, although it’s converted now! No shelter for steerer and wheel steering. Very unpopular I would think. Obviously no thought for the crew. There would have been little or no shelter for crews on many wide boats at the time. Also, requirements for a boat where the steerer went home at night would have been seen as less onerous than for boats on which people lived. Yes, replacement for joey boats. They still wouldn't like the wheel steering, which turned the steerer as well. Or sitting on the engine. Hi Chris, wondered if you could clarify what you mean by "turned the steerer" and "sitting on the engine "? We have an ex waterways tug at our wharf, which has that same method of propulsion/ steering. It's a 360 degree "leg" which, although a total pain when manoeuvring, has no requirement for the steerer to turn in any way. So the manufacturers manage to call it a butty rather than a motor boat in their own advertising! (And "barge" as well, which many will also argue with). Hi. If you look at the photo of 'Anne' you will see that the drive unit is slightly turned out of line. The steerer has a very basic seat on the left side of the engine and the whole drive unit turns, steerer and all. Not sure how far the unit could turn, It seems to be limited by the huge dollies. I have seen these on the Thames, most peculiar until you realise what they were. Okay Chris, if you've actually come across one, I'd have to give way to that. Odd though as any movement would be limited, as you say by the bollards, or by the width of the slot that the leg drops down. Whats also interesting is the boat appears to carry a spare prop, reasonably easy to fit as the leg is arranged to lift up to clear fouling etc. Also, the dial indicating the position of the propeller can just be seen, through the spokes of the wheel, on the top of the helm. Forget the bit about the spare prop, optically challenged, too much welding.